Habitat: Agrimony is native to the temperate regions of the Northern Hemisphere. It can usually be found in woods and fields. 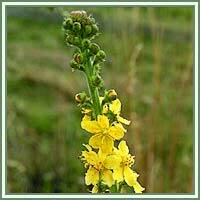 Description: Agrimony is a perennial herbaceous plant. It has a long, black root and cylindrical, slightly branched stem, covered with soft hairs. Leaves are pinnate, oblong-oval and toothed. Flowers are small and numerous, produced in terminal spikes, with five, egg-shaped petals. Each flower has a small bract at the base. Medicinal use: Agrimony has long been used as a medicinal herb. It was traditionally considered to be an excellent blood purifier and a delicious spring tonic. It helped especially in cases of colds, fevers and diarrhea. It also had a reputation of being very helpful in treatments of liver complaints. Agrimony is a powerful astringent, and it is usually used as a throat gargle to relieve the throat pains and to decrease inflammations. 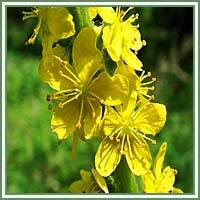 Used externally, Agrimony can help in cases of sores, ulcers, skin eruptions, pimples and blemishes etc.